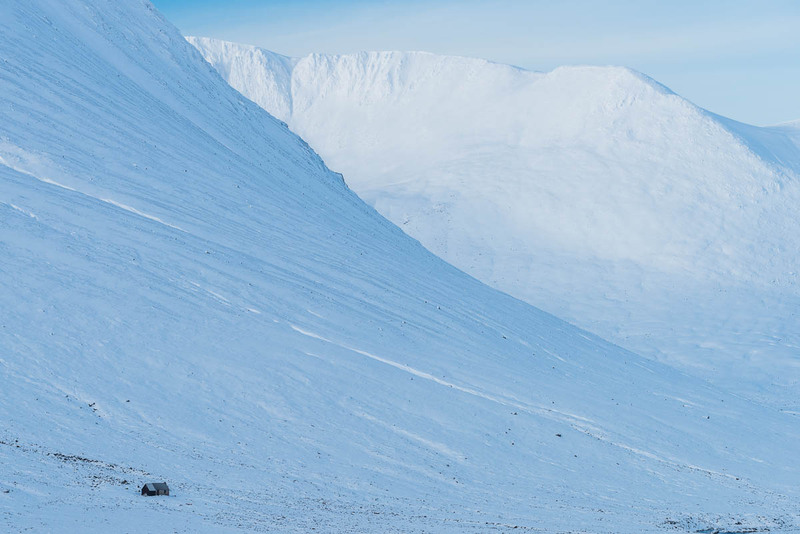 The Cairngorms play host to some of the most inhospitable winter conditions in the UK. Numerous news stories of rescues and fatalities of climbers in the region make it seem daunting and inaccessible; a challenge for the seasoned climber, let alone your everyday photographer. Yet, in a way, these were the reasons that I wanted to go. With a couple of winter adventures behind me, I felt more confident about attempting at least one hike in this intimidating terrain. I own a well thumbed copy of Joe Cornish’s ‘Scotland’s Mountains’ book and I have enjoyed reading about Joe’s experiences in the Scottish landscape. I have always been drawn, in particular, to his description of an eventful trip to the Larig Ghru and an overnight in a bothy. Essentially an abandoned building, bothies are free to use shelters used by hillwalkers and many are maintained by the Mountain Bothy Association (MBA). 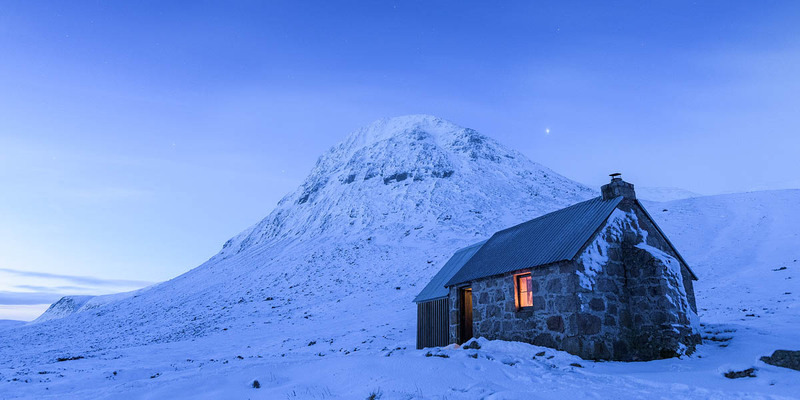 Bothies can be found all over remote parts of Scotland and are a welcome sight at the end of a long walk or when the weather turns for the worse and a night in a tent isn’t an appealing option. They do, however, lack basic amenities such as running water and electricity. Yet some of them have a fire place for much needed heat, just as long as you’re willing to carry the fuel in that is! 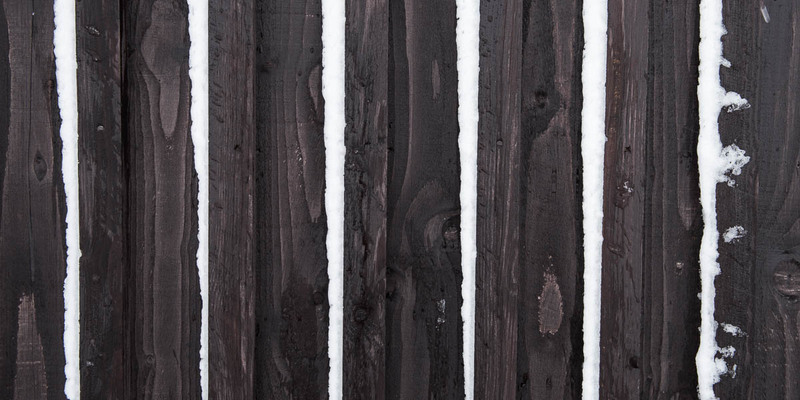 After the mildest start to a winter since records began, my plans to spend time in snowy mountains were threatened. Fortunately, after watching the forecasts like a hawk, a weather window appeared. A bank of unsettled weather, giving way to high pressure guaranteed some calm weather for at least 2 days. It was mid-January and Alex, who was joining me, had driven up to my home in Durham the previous day. Alex and I had been planning this trip for the past few weeks so we were excited to finally be on our way. 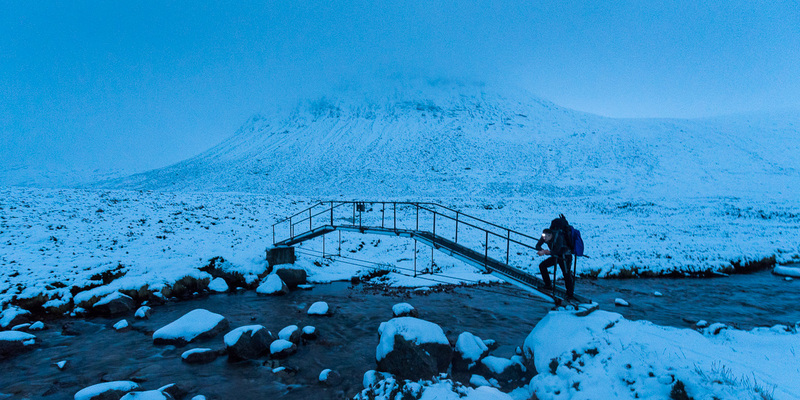 We set off early, intent on spending a few nights at Corrour Bothy in the heart of the Cairngorms. 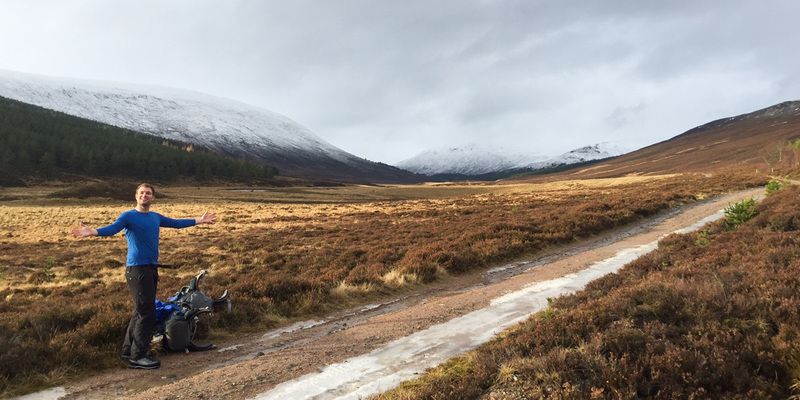 Having debated on where we would walk from, we initially decided to hike down the Larig Gruh from Aviemore. 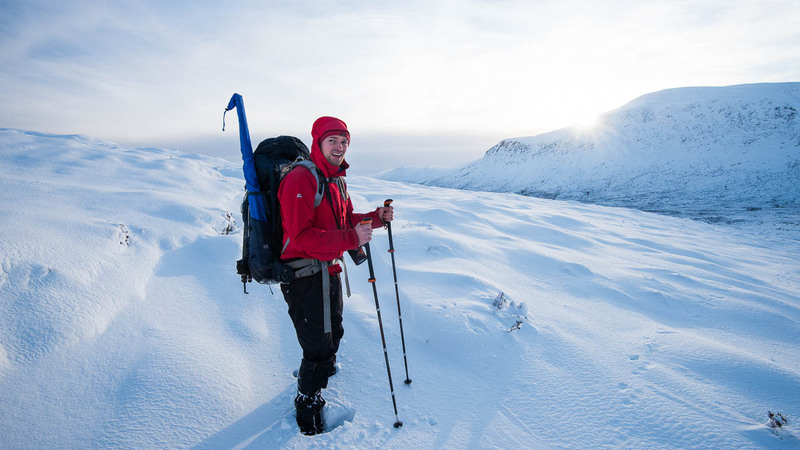 However, it soon dawned on us that hiking the route in fresh snow would take a huge toll on us both, especially with our large 25kg packs. So we opted for the shorter 7 mile route up Glen Lui from the Linn of Dee. A long drive through some wet and windy weather quickly turned wintery as we progressed along the snow covered Cairnwell Pass. This gave us a indication of the conditions we could face when we got to the bothy and, helpfully, reminded us to pick up some kindling for the fire when we reached Braemar. 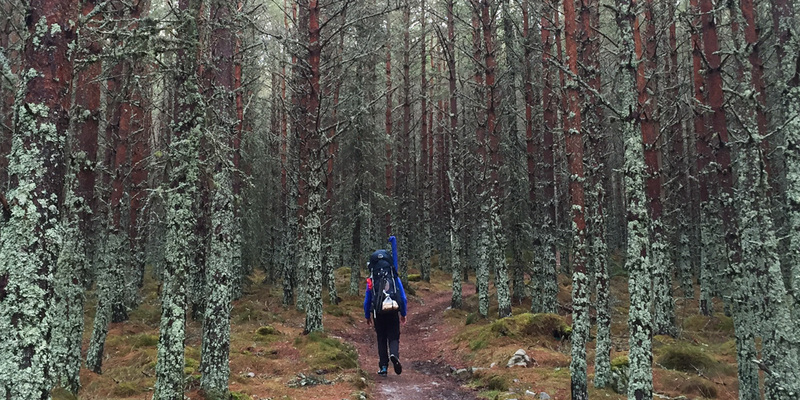 We arrived at the Linn of Dee around midday, loaded up our packs, including coal and kindling, and set off, hoping to reach the bothy in a couple of hours. The coal started to feel like quite a burden after the first couple of miles, which was a fairly dull trudge along a 4×4 track. 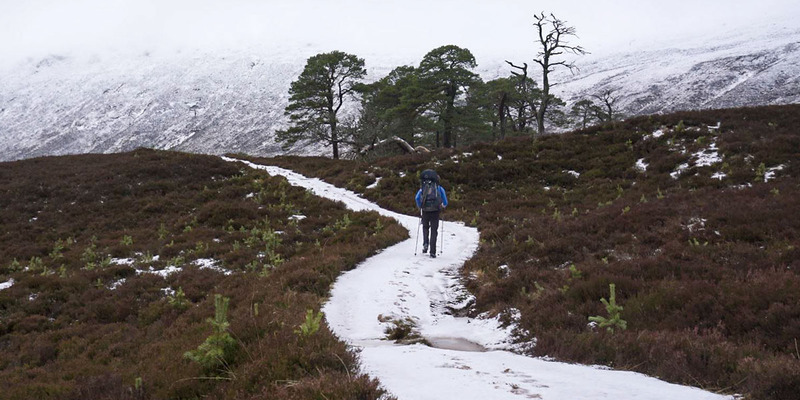 Once we’d passed Derry lodge we began to see snow on the ground. We were glad to see all the bridges were still intact after the flooding over the Christmas period, although some parts of the paths had been washed away. As we gained altitude fatigue really started to kick in. Our fitness wasn’t at its best after the Christmas break (I was certainly regretting those extra mince pies!). After losing my footing over a river crossing, I knew I was getting tired and with the light fading we needed to get the bothy as soon as we could. 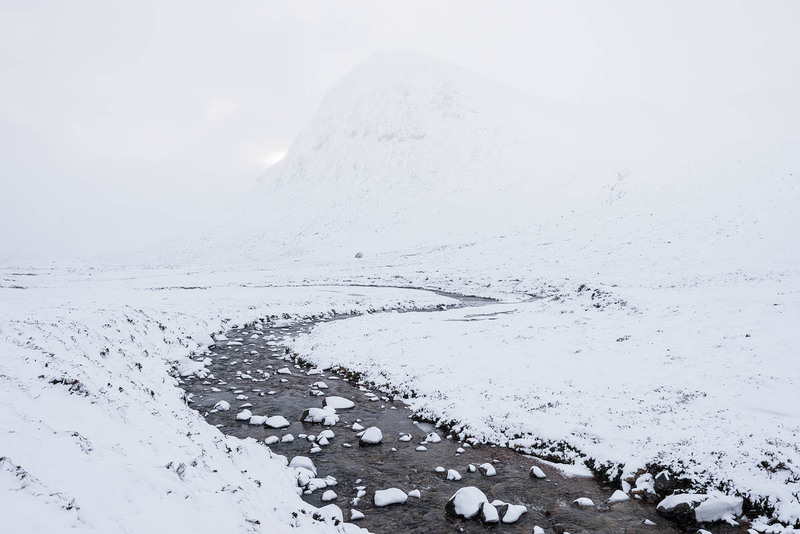 We had been wondering what the ground conditions would be like around the bothy and, although tired, we were excited by the deepening snow as we got closer. The low cloud shrouding the hills and breaking trail made the hiking much harder, but with the bothy in sight we knew we would be inside soon. I was hoping, perhaps optimistically, that someone would have already arrived and started a fire but alas, we opened the door in to a cold, dark, lifeless room. I was pleasantly surprised, however, by how well maintained the bothy was. It was fully cladded inside and had a working fireplace. I knew we would be warmer here than in our tents. With the added bonus of a compositing toilet next door, this was going to be more like glamping! We got the fire going, grateful for the firelighters that we had picked up at the last minute. We were pretty frugal with our coal supply because we were not sure how many days we would be staying. We spent the evening huddled around the fire before eating a well-earned dinner and getting into our sleeping bags. Whilst listening to the crackling of the fire and chatting about the possibilities ahead, we heard a strange rustling noise. At first we both thought it was one of us, snow sliding off the roof, or maybe a hiker arriving late. It turned out to be none of the above. After some rummaging around, we found the source: a resident mouse, which had been busy munching through packets of McVities breakfast biscuits and Ainsley Harriet Mediterranean cous cous. The mouse had made its home between the cladding and stone walls and we had no way of stoping him from venturing out to feast during the night. We decided to name him Lui, after the glen we just trekked up, and eventually got to sleep. With hopes of seeing the surrounding mountains at dawn we were left a little disappointed as the low cloud hadn’t lifted. 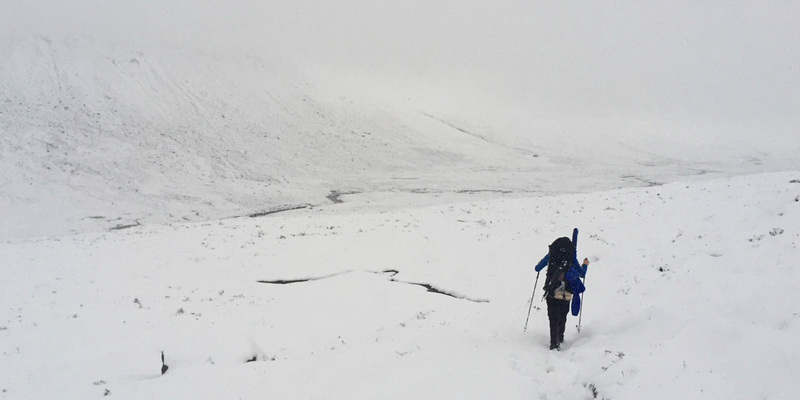 As the morning progressed, it began to snow heavily and our plans of reaching any peaks were soon scrapped. Feeling a little claustrophobic, we thought we’d head out and explore the area anyway. It was at this point that I regretted leaving my waterproof trousers in the car and after an hour wandering through the wet snow I was soaked. Back in the dry bothy, we started the fire again and I spent the rest of the afternoon sat as close to the fire as I dared to dry off. With another early night in store, we decided to take a few photos of our accommodation and delved into a book of ‘Mountain Trivia’ that had been left behind by another visitor. With a more promising forecast for the following day, we went to sleep as Lui reappeared and tucked into his dinner. As dawn approached, the skies began to clear. At one point, looking straight up, I asked Alex if a defined blue shape was a cloud or a mountain. 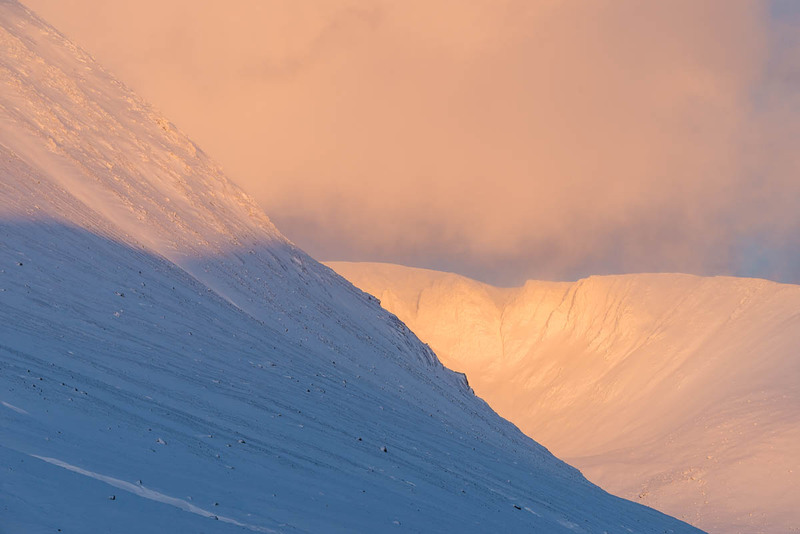 As the last of the cloud began to lift, it turned out to be the UK’s second highest peak, Ben Macdui. This was the first glimpse of our surroundings and the sheer scale of the landscape around us quickly became apparent. Sitting next to Ben Macdui is Carn Toul and Braeriach, which just happen to be the UK’s third and fourth highest mountains, respectively. I made my way to a spot that I had found the day before, which had a view of Devil’s Point, and set up for filming. The sunrise was beautiful. Once the light became too harsh to photograph in, we retreated back to the bothy. We had some lunch and made plans for the remainder of the day but, with thickening cloud rolling in from the west, we decided we should head back to Braemar. The bothy with Ben Macdui behind and a toilet with quite possibly the best view in the UK? 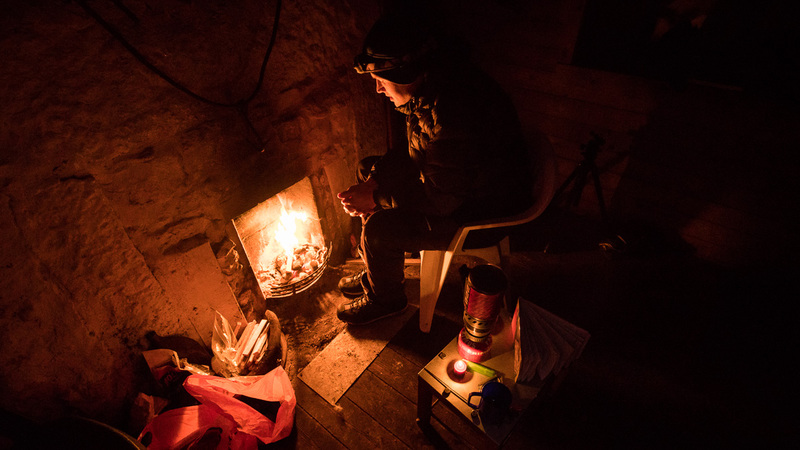 We had a quick clean of the Bothy in preparation for the next winter trekkers and left our remaining coal, kindling and firelighters for the benefit of anyone who had come unprepared. We loaded up our packs, thankful of the much lighter weight, and headed off around 2pm with hope of catching some images on the way out. The return trek was long and monotonous, especially in the dark, but we’re glad to see the car. As the temperatures had plummeted to -10 it wasn’t surprising it was completely frozen, including the locks! After 20 minutes of ‘defrosting’ we finally got going. With nowhere booked and limited places to stay we stumbled across a great little hotel in the middle of Pitlochry with some great food and a warm bed. As much as I appreciated the warmth and comfort, a little bit of me wanted to be back in the bothy listening to Lui disrupt the silence of the wilderness. Fantastic, loved reading this, as i felt i was there with you both. 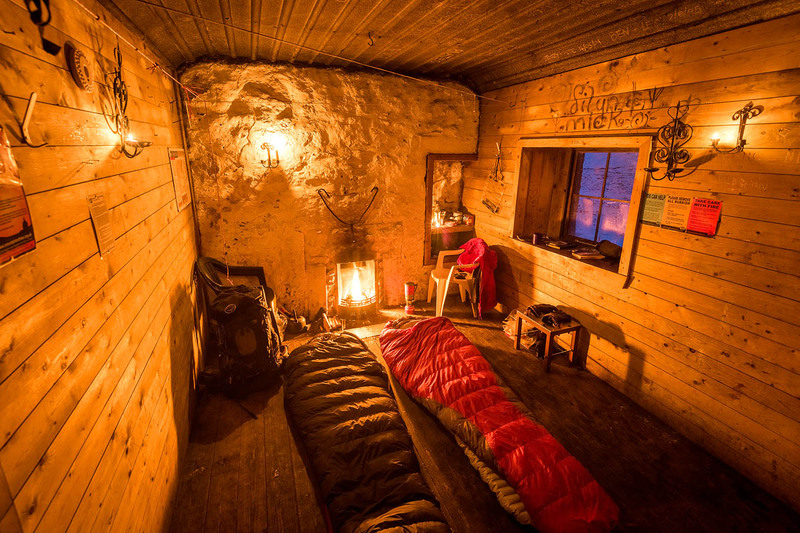 Your pictures are outstanding, especially the cosy bothy. Thoroughly enjoyed reading as i sit on my 3 seater swing, listening to our waterfall in our summer house in the garden. Nice post – enjoyed the story! Fantastic story with beautiful pictures a Perfect combination. Thanks for giving us an insight to your journey.. Sometimes just being in these wildernesses is enough without having to scale the mountains.Time to enjoy the majesty and scale of what surrounds you. Well narrated with some lovely photos. You guys will never forget being there. Fantastic. 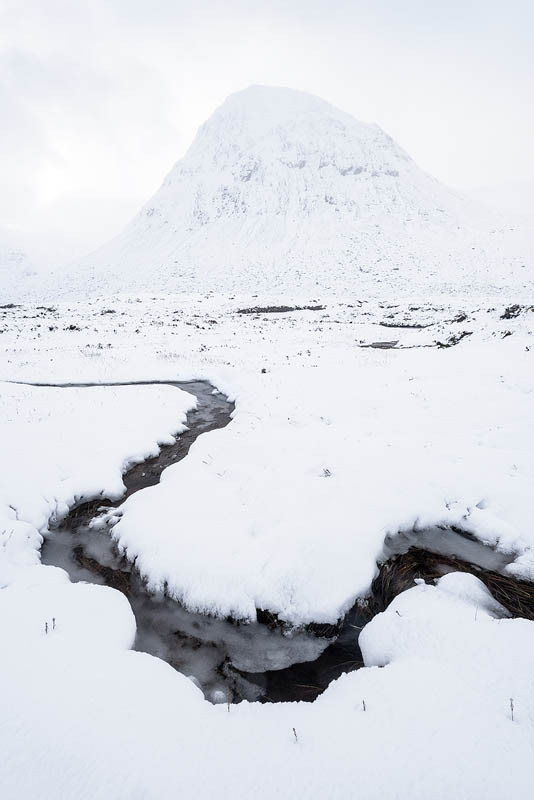 Since immigrating all I want is to be home in scotland on adventures like this. I’ve never stayed in a bothy but it is not on the bucket list. Thank you for taking the time to share! 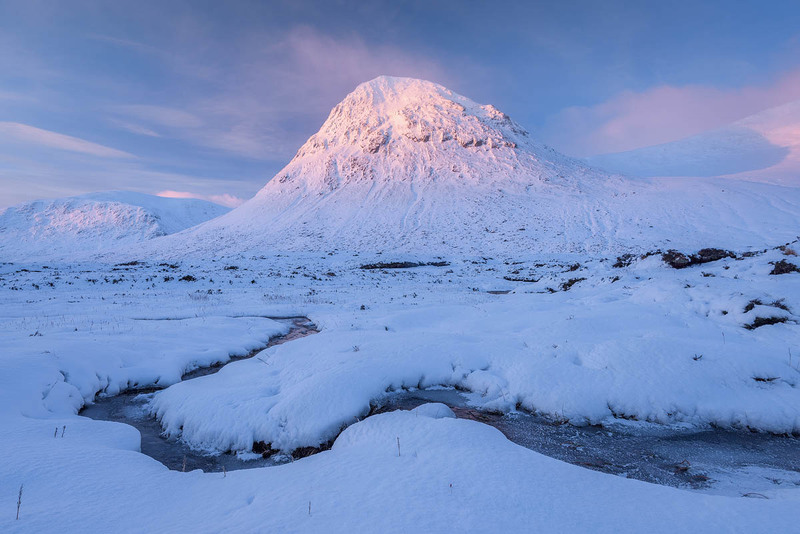 A typo there…a bothy is NOW on the bucket list! As part of the volunteers who renovated Corrour bothy with the addition of the dry-composting toilet. We are in the process of entering the bothy into the Cairngorm National Park Design Awards. I have come across your photos and the photo of the bothy with Devil’s point behind would be perfect for us to use in the submission. Would there be any chance we could use the photograph? Of course, if possible then we will credit yourself. Hi Kenny, Do you have an email address I can contact you on? I saw your picture of Corrour Bothy in the Times today and was wanted to find out more about it . It has been a fascinating read ,I am looking forward to the book ! Thanks Des, I’m glad I wrote the blog now! I’m looking forward to the book too, some superb entries this year.